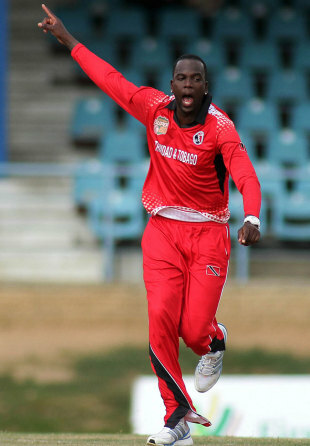 Kevon Cooper's five-wicket haul helped Trinidad & Tobago beat Combined Campuses and Colleges by eight wickets in Port of Spain. CCC were put into bat, but couldn't build substantial partnerships, as they lost wickets at regular intervals. Only four of the eleven batsmen got double-digit scores, as CCC's batsmen were restricted by the bowling efforts of Kevon Cooper, who picked up a miserly career-best 5 for 17 in his quota of overs. He was ably supported by Yannick Cariah, who picked up 3 for 14. CCC were wrapped up for 97 in the 38th over. T&T were assured in their chase, as the openers put up 40 for the first wicket, followed by another 44 runs when Adrian Barath and Justin Guillen got together. T&T were able to finish off the chase in the 22nd over. Barath would finish for an unbeaten 40. With this win T&T move to second place in the table. Jamaica's combined batting effort ensured they beat Leeward Islands by 57 runs in Kingston. Leeward Islands elected to field, and their decision was backed initially by their bowlers, as they reduced Jamaica to 10 for 2 early on. Danza Hyatt and Andre McCarthy put up a 92-run stand to lend stability to the order. McCarthy was run out, bringing Tamar Lambert to the crease, who struck an unbeaten 77. Hyatt fell one run short of a deserved hundred by getting himself run out while going for the decisive run. Jamaica finished 253 for 4 at the completion of their overs. Leeward Islands required big partnerships early on to steady the chase, but lost wickets regularly. Their captain, Sylvester Joseph, played anchor through the innings, with Tonito Willett (20), Jahmar Hamilton (19), and Lyndel Richardson (19) chipping in. Joseph would eventually fall for 83, as Leeward Islands folded for 196 in the 45th over. Both Nikita Miller and Andrew Richardson picked up three wickets a piece. This win maintains Jamaica's position on top, but by a slight two-point margin over T&T. A career-best five-wicket haul from fast bowler Jonathan Carter helped Barbados beat Windward Islands by 99 runs at Kensington Oval. Carter ran through the lower half of Windward's line-up, as they were eventually bowled out for 180 in their chase. The victory gave Barbados five points, and lifted them to third in the table. Batting first, Barbados lost their opener Rashidi Boucher in the seventh over, but thereafter a series of partnerships, led by 88 between Kraigg Brathwaite and Kirk Edwards and a quick 77 between Dwayne Smith and Kenroy Williams, pushed them to a competitive 279. Edwards and Smith scored half-centuries, with Smith scoring a 29-ball 53, smashing three fours and four sixes. Fast bowler Nelon Pascal took three wickets, but was the most expensive Windward bowler, giving away 87 runs in ten overs. Windward's innings, in contrast to Barbados', failed to gather any momentum. Seamers Jason Holder and Fidel Edwards had reduced them to 29 for 3 by the sixth over, and although Andre Fletcher (42), Dalton Polius (37) and Liam Sebastien (33) tried to revive the chase, Carter ensured they lost five wickets for 27 runs. Windward eventually folded in 47 overs.